Vegan Runner Eats » Marathon Training » Week 3 of Marathon Training. 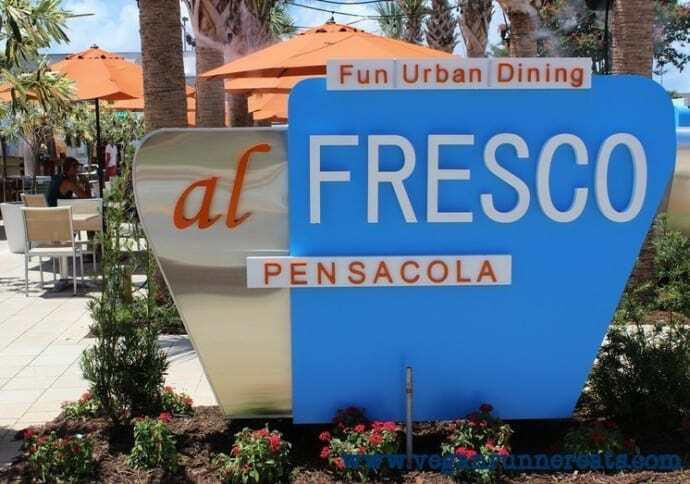 Our Surprising Vegan Experience in Pensacola, Fla.
Today’s post is about vegan-friendly restaurant scene in Pensacola, Fla (the site of my upcoming marathon! ), and my running in week 3 of marathon training. It’s Monday again! I’m amazed at how fast time goes by these days! It must be all the fun that I’m having with my blog, right? It’s hard to believe that I’m starting the fourth week of my marathon training plan as well as the fourth week of running this blog… but that’s exactly what’s happening. All right, back to the subject. So how was my running in week three? I’m glad to be getting more confident that I’m on the right path! The runs are getting more steady and more enjoyable: on my Sunday morning long run I tapped into that lovely ‘runner’s high’ state by the end and decided to go for another mile and a half on top of the originally intended distance. It looks like my body is getting used to the combination of higher intensity workouts and my plant-strong diet – that’s a reason to celebrate! Later in the day on Sunday, Rob and I made a lovely trip to Pensacola, FL – home of the marathon I’ve signed up for in November. I’ve been to Pensacola many times since I moved to the Gulf Coast area in 2006, and at first it didn’t impress me much. But in the past few years somebody in the city planning/development must have decided to make it more attractive, and now you can really see the change for the better! It was a beautiful day – well worth an after-lunch walk in the park. Plaza De Luna park in the downtown area offers beautiful views of Pensacola Bay. Years ago, this place used to host Pensacola Municipal Auditorium building that “…hosted concerts for everyone from Elvis and Jerry Lee Lewis to Tori Amos and Puddle Of Mudd” (source). The building suffered severe damage by Hurricane Ivan in 2004, and it was decided that it needed to be torn down. The debris was used in building offshore fishing reefs in Pensacola Bay. And all of us now have a chance to enjoy the waterfront access and spectacular views at the south end of Palafox Street at Plaza De Luna! Whenever we take day trips, the issue of where to find vegan-friendly lunch food arises… Thankfully, the longer I’ve been vegan, the broader my network of possible solutions is getting. I admit that the restaurant scene in the Deep South has catering to vegans at the very end of their list of priorities… but even here you can accidentally find a true gem! If you live in California or in the Pacific Northwest, it’s unlikely that you’ll be impressed. For our so-called Flora-Bama area, this is the bee’s knees! 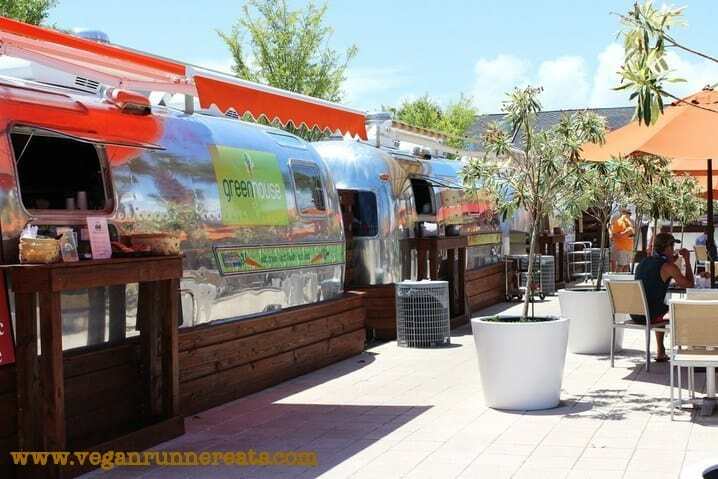 A few food trucks cater to public in a relaxed atmosphere with music playing in the background, and everyone can get something different in case they don’t feel like eating the type of food that other people in their company are having. The emphasis is made on serving local, non-chain-restaurant food that’s hearty and affordable, but not necessarily vegan. Naturally, I was looking for something vegan-friendly, and I was glad when I found it! There are at least two options: a panini melt with eggplant, roasted peppers, and vegan cheddar-style cheese that’s called (surprise surprise!) The Vegan; and fried avocado (!) tacos with cabbage slaw and tortilla chips. The latter comes with a side of peppery sauce that’s, well, not vegan, but the tacos are just as good without it. The Green House truck that you see to the left has a good variety of fresh juices and smoothies from local produce, but, unfortunately, no meat-free lunch entrees/sandwiches – at least the day we were there. There was another time when Pensacola restaurant scene pleasantly surprised the new vegan in me. I’d like to save it for another post, so let me just say: on that day, Rob and I just got back from a trip to New York where we had a lovely dinner at the famed vegan restaurant Blossom. When we landed at the airport, I Googled ‘vegan restaurants in Pensacola’ out of curiosity – and that’s how we discovered the ALL-VEGAN restaurant called Sluggo’s. And the food… well, as I said, let me save it for another post. Until then, if you find yourself in Pensacola, remember: Sluggo’s, Sluggo’s, Sluggo’s! Do you have favorite vegan (or vegan-friendly) restaurants in your town? What kind of food do they serve? Tagged marathon training, Pensacola Marathon 2013. Bookmark the permalink. 4 Responses to Week 3 of Marathon Training. Our Surprising Vegan Experience in Pensacola, Fla. I could never get into vegan cheese. Have you found a good one? Deepa, I haven’t tried a whole lot of the store-bought varieties, mainly because they are a highly processed food, but I’ll admit that Daiya brand Mozzarella-style shreds work pretty well on homemade pizza, and make amazing eggplant parmesan! Vegan cheese might not be much to eat by itself, but thankfully your cheese cravings go away after a few weeks on a plant-strong vegan diet. One of these days I’m going to publish a post about why we all are so much better off without dairy in our life! There are so many different types available – its just about finding the ones you like. Like dairy cheeses, not all vegan cheeses are good. I usually make my own mozzarella and nacho cheeses – google them for recipes. The forner is made from cashews anf chickpea brine (the fluid in the tin of chickpeas that we usually throw out) and nacho cheese is made from potatoes and carrots. Both are dead easy and super cheap. I have my own versions of these somewhere on my instagram staceymaymay if you feel like digging in there. Good luck!